This is the type of Terrier that is cuddly in appearance as well as their attitudes, as the Bedlington Terrier hounds are adorable creatures and extremely friendly dogs. Very loyal this form of Terrier is and makes a wonderful family pet. They follow commands with ease, and are not a very noisy dog to have living in a home that desires a peaceful and quite environment. Generally, they are passive and timid creatures, but in the event they are challenged by another dog they are fully capable of defending themselves. When they encounter a small animal of any sort out in open, they can and in most cases will chase the animal. If the animal resides in the same home as they do, often they are very adaptable dogs with those animals they share their space with. The Bedlington Terrier is an active breed and will strongly desire to run and play in an open space for some part of their day. They are natural chasers and would require at the very least, a long walk each day. Their thick and soft fur coats will need grooming done each week, some dogs of this kind will require it additionally each week such as twice to get that trapped debris out of their fur. Shaping the fur coating is also required to ensure that the dog will have a nice look to them. Nail clipping is also a necessary grooming requirement for all dogs that will need handled as their nails get longer. As far as any major health concerns are noted involving the Bedlington Terrier breed, the only major one reported by experts is a condition called copper toxicosis. This occurs when there is a large amount of copper present inside the liver and it continues to develop hepatitis in some dogs. They can also develop other minor reported ailments such as retinal dysplasia, renal cortical hypoplasia and distichiasis as well. In some rare occurrences, this breed has also been associated with suffering from patellar luxation as well. The vet may recommend a DNA screening to locate the amount of copper developing inside the liver of the dog, as well as some other routine tests for their eyesight. The noted average lifespan of a Bedlington Terrier is from twelve to fourteen years long. They generally weigh from seventeen to twenty three pounds as full grown canines. 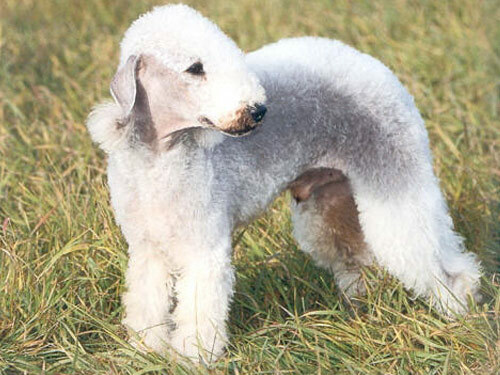 The Bedlington Terrier originally hailed from England in the 18th century. It was derived from a breed of terriers known as the Rothbury Terriers at the time when they were first discovered. In 1825 a man named Joseph Ainsley decided to breed two Rothbury Terriers and alas, the Bedlington dog was created. They became well known for hunting rats, small vermin of all sorts and badgers as well. Once the late 1800’s arrived, they grew in popularity yet again by becoming a breed of show dogs on top of their hunting abilities. Currently, they are a favorite breed for a household pet for their timid personalities and exceptional behavior.